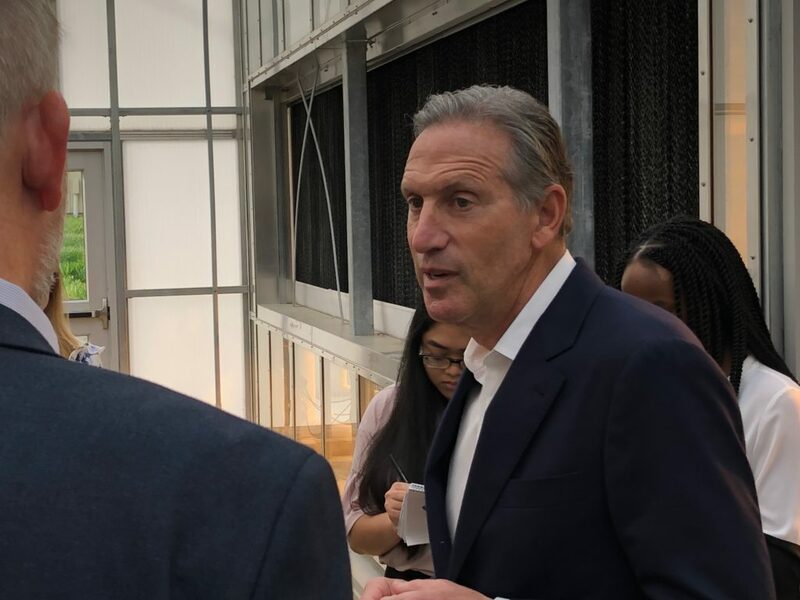 MANHATTAN — Former Starbucks Chairman and CEO Howard Schultz made his way through Manhattan Wednesday as part of his listening tour across Kansas. The businessman is exploring a potential presidential campaign as an Independent in 2020. Schultz tells KMAN he doesn’t believe critics who say he’ll be a spoiler in the election. Schultz discussed his own successes with Starbucks and how he’d attempt to translate that to the oval office, should he decide to run. 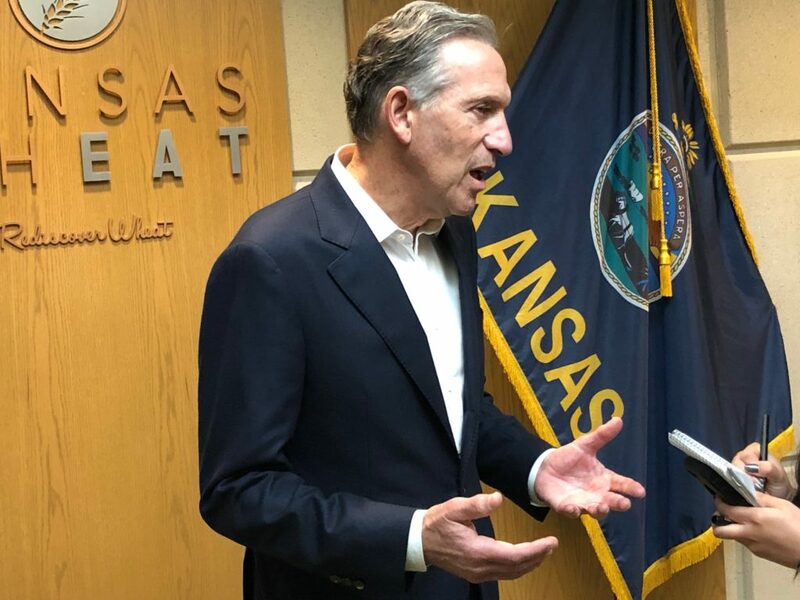 Schultz began his listening tour in Overland Park Tuesday, and also spoke at events in Lawrence and Topeka. 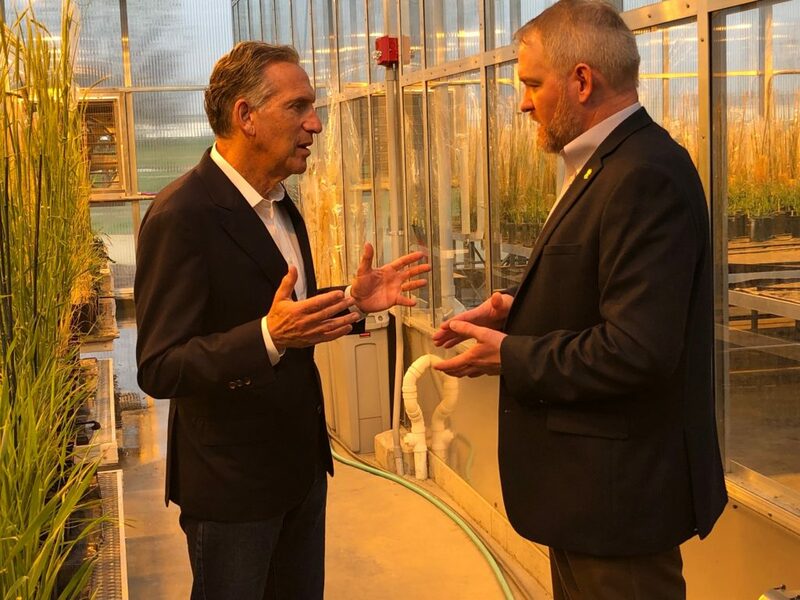 He toured the Kansas Wheat Innovation Center in Manhattan Wednesday and also met with members of the Manhattan Area Chamber of Commerce. Schultz says Americans including Kansas farmers have been hurt by the ongoing trade wars, a broken immigration policy and high costs of healthcare. Schultz says on the issue of immigration reform, he agrees with Republicans that the country needs strict border security and that Immigration and Customs Enforcement (ICE) should be funded. He agrees with Democrats on humanity issues, supporting a pathway to citizenship for so-called Dreamers (undocumented students and youth). He also supports a humane way to deal with the 11 million people in the country unauthorized. Schultz was a lifelong supporter of the Democratic party, and supported Hillary Clinton for president in 2016. He switched his party affiliation to Independent in 2019. When asked if that hurts his chances to pick up moderate Republican support, Schultz says he doesn’t believe it will. Schultz says by being able to listen and learn from Kansans on this tour, he’ll gain more empathy and compassion to what Kansas families are dealing with and how he can help if he decides to run for president. Some media reports say a decision could come as early as this summer. Schultz was our guest on the KMAN Morning Show Wednesday and re-aired during KMAN’s In Focus.